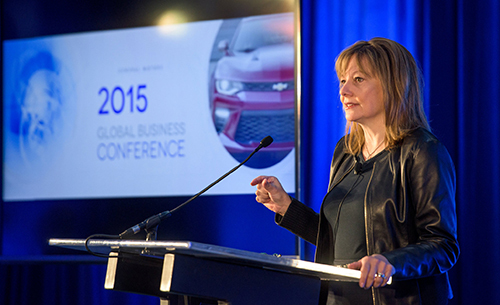 ▲ On October 1st, Mary Barra, CEO of GM, explained a future technology of the company on a conference held for shareholders at Milford Proving Ground in Michigan. Mr. Jane is a commuter who lives alone in a major European city. He rides his new personal transporter on a road especially for low-speed vehicles to go to work. Thanks to personal transporter, his commuting time has shortened compared to the time spent on public transportation. He arrives at his work and leaves his personal transporter at a special lot nearby. This is one example of a growing number of personal transporter users in Europe. A personal transporter is an electric-powered, short distance, and low velocity vehicle for one or two people. There are various types of personal transporters. One is the electrical wheel. It usually has one or two wheels on an axle, and users ride on a platform attached to the wheel. Segway PT and Ninebot are the best known examples. Another type is the electric bicycle. It looks just like a usual bicycle, and the only difference is that it is powered by an electric motor. Also, if the power runs out, the user can use the pedals and it will work just like a bicycle. The last example of personal transporter is the electric skateboard. It is also powered by electricity and can be operated with a remote controller. One common usage of persoanl transporter is for tourism. It is easy to see tourists on Segways in major cities in Europe. Rome, Paris, London, and others have more than 12 Segway tour centers per city. Moreover, the usage of personal transporter has broadened its territory. The number of Facebook pages on personal transporters is one example that shows this. The Segway Facebook page is liked by 31,234 people and Ninebot has 4,506 likes, which shows how the popular personal transporter has become. As the number of single person households is increasing, people are demanding for transportations for one person. By using personal transporter, transit time wasted due to traffic can be reduced to almost zero. This makes short distance commuters fond of personal transporters. Also the price of personal transporter has decreased because of the increased efficiency of the battery. In the past, expensive batteries were essential for personal transporters, but technicians have made progress and introduced cheaper and more efficient batteries, which has led to lower prices for all types of personal transporters. According to the Grand View Research Inc., the global market for personal transporters, is projected to show an average annual increase of more than eight percent. In 2011, 50 million personal transporters were sold, and in 2020, 100 million are expected to be sold. Due to its potential, a lot of companies are joining into this market. The market leaders are GM’s PUMA, Honda’s Uni-cub, Renault Samsung’s Twizy, and Xiaomi’s Segway. Many countries are making efforts to distinguish personal transporters from regular vehicles. European regulators have made seven different levels of micro-cars based on the maximum velocity, power, and weight. Since 2012, Japan has prepared for this new kind of personal transporters. For micro-cars engine sizes from 50 to 125cc, Japan made a new category for cars smaller than compact cars. The United States has regulated personal transporters as low-speed vehicles. For this new type of transportation, U.S. set up license and registration requirements, instruction on driving methods, and insurance for users, as same as regular vehicles. Also, many countries have tried to make friendly environment for personal transporter users. France, the United Kingdom, and Italy made low-speed tracks only for vehicles with a maximum speed of 30km per hour. Germany and the Netherland have also made an electric-bicycle-only roads, and many other European countries are setting up recharging stations and parking places to accommodate the popularity of personal transporters. Personal transporters have become popular in Korea as well, especially after Xiaomi introduced them with much lower prices compared to that of previous models. The increased popularity of personal transporters is shown through media as well. “Muhan-dojeon,” a popular Korean TV show, once had a concert where the main singer used a personal transporter. Also, in a Korean drama “Who are you, Hak-gyo 2015,” there was a scene where the main actor was riding a personal transporter. According to the internet shopping mall, G-market, in 2015 from July to October, the number of personal transporters sold increased to seven times, compared to the amount sold during the same period of 2014. However, even though the popularity of personal transporter in Korea has increased, the regulations and legal system are still lagging behind compared to other countries. First, Korea lacks the framework for categorizing personal transporters. Personal transporters with displacement volume of below 50cc and rated power of below 0.59kw are considered as motorized bicycles. However, newly introduced personal transporters’ rated power varies from 0.333kw to 1.5kw, which leaves personal transporters with a rated power of above 0.59kw nowhere to fit into existing rules. This makes situation of law enforcement very difficult, as they cannot operate accident prevention activities, such as regulating drunk driving or riders who are not equipped with safety gear on uncategorized personal transporters. Insurance is also a problem. The law does not make personal transporter users to get insurance. As a result, insurance companies are not making any products for personal transporters. Also, personal transporters are not able to have any insurance since they are not registered and do not have plate numbers. In order to have any kind of insurance, the vehicle must be registered and have a plate number. In response to these concerns, the Korean government is starting to make a legal infrastructure for personal transporters as well. The Ministry of Trade, Industry and Energy is planning to make new definitions, categories, regulations, and systems for micro mobility in cooperation with the Korea Automotive Technology Institute and the Korea Transport Institute. The Congress has submitted five new amendments to consider electric bicycles as regular bicycles so that they can be driven on the bike roads as well. According to a report from LG Economic Research Institute, when driven in a separate place from other vehicles, riding personal transporters would not be that dangerous. Also, when Active Safety gears are equipped and low-speed tracks are made, the overall value of personal transporters as a legitimate means of transportation would increase. The regulatory system and the operating environment are the two biggest factors that affect the safety of personal transporters. However, the insurance problem still remains. Samsung Fire&Marine Insurance Company official explained, “There is no insurance product that personal transporter users can register for now,” and no comment on preparations for personal transporter insurance was given.